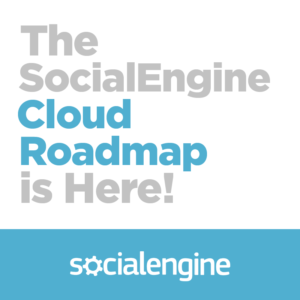 We are pumped to announce our SocialEngine Cloud Roadmap and look forward to your ongoing engagement with us. Like most of you we are done waiting, so we are sharing a screenshot of the roadmap as our integration with the roadmap platform continues. The platform is called Ramen.is which allows you to provide comments, input, vote and respond to polls. It’s pretty cool. Our hope is to have the full integration completed in the next two weeks, so you can access the roadmap from your admin panel. The Roadmap is not a bug report or customer service platform. Please see our SocialEngine User Community to post questions or submit bugs. It’s important to note this is also not a timeline of exactly when the next feature will be released. Rest assured, we are getting to items as fast as we can and now you can see our priorities. This is a great way for all of us to share our insights, exchange ideas and define priorities. You will see there are five categories (Ideas, Planned, Being Developed, Deployed, Validated) where the content is grouped. Within those ideas there are three buckets (Next, Ready, Being Scoped) where we are giving insight to priorities or areas we are exploring. As discussed work to complete the integration with Ramen is still underway. In the meantime we have posted a screenshot of the SocialEngine Cloud Roadmap for you to view. For those of you running a SocialEngine Cloud site, we will follow up soon on how to access and engage with us on the SocialEngine Cloud Roadmap.